The vast majority of the stampings produced at Regal Metal Products is by the Progressive Die Method. However, we perform secondary off-line operations when needed. To complement our press operations we also have in-house facilities for welding, bolt staking and assembly work. We out-source production heat-treating plating and painting when these services are needed. • Bed sizes ranging from 36"x60" to 60"x168"
Progressive Die Stampingis a very cost-effective way to make many parts. 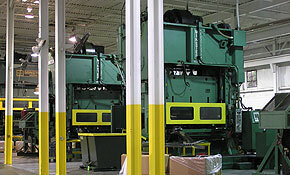 Material of the proper thickness and width, in coils, is converted into a completed part with each stroke of the press. This is achieved by passing the tail of the coil thru a straightener, into a feed, then thru a die with multiple stations. The material strip progresses from station to station, where work is changed by notching, percing, drawing, forming as needed. The completed part is then cut-off or blanked thru the die into a container. By this method (1) press operator can perform the work of many with no part handling. Once the progression strip is fed thru the die, the press runs continuously.